Discover the power of Crystal Reports for more effective data management, presentation and distribution. 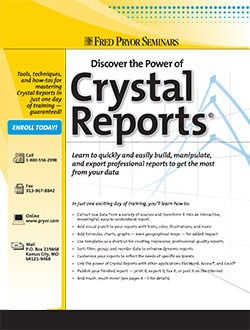 Crystal Reports is today's most widely used report writing application. In just one day, you'll learn how financial data, sales data, personnel data — any information you have stored in a database — can be transformed into an easy-to-understand report that can be distributed via your local area network, the Internet, fax, email or a printed hard copy with just a few clicks of your mouse! You'll learn how to add illustrations, charts, graphs and more to give your reports a professional, finished look. You'll save time by learning to create customized templates and short cuts you can use over and over again. This incredible program puts you in control of your report from beginning to end, so there's no more working around your IT department's schedule. Our Crystal Reports "crash course" gives you everything you need to start turning out sophisticated, interactive, professional-quality reports as soon as you return to the office! You'll learn to use this powerful software program to instantly extract data from virtually any source to present it in a logical, meaningful report format that is simple to understand, easy for others to access and a breeze to modify, update or revise. One day of our training puts the power of Crystal Reports at your fingertips. You'll learn everything you need to know to create professional reports simple, fast and virtually trouble-free! The four editions of Crystal Reports (Standard, Professional, Developer, Advanced) and what each is capable of and how Version 2008 brings them all together!